Posted: 07/16/2012; Pediatr Nurs. 2012;38(3):133-136. © 2012 Jannetti Publications, Inc. The purpose of this study was to acknowledge and interpret the stories and perceptions of pediatric nurses who care for children left unaccompanied during their hospitalization. This was a phenomenological qualitative study conducted via interviews using open-ended questions. The study was conducted in a large Midwestern pediatric hospital that has both urban and suburban settings. Twelve nurses voluntarily completed the interviews. Recruitment was accomplished though a group e-mail that was sent to all registered nurses at the hospital complex. Nurses made assumptions about families particularly when the family did not communicate the reason for their absence. Unaccompanied children received equal nursing care but often received more attention than children whose families were present. Care for unaccompanied hospitalized children presents more challenges to nurses and may not be optimal for children. Nurses should examine their feelings and judgments about non-attendant families. Staffing levels should take into account whether the child has a guardian at the bedside. Pediatric nurses often care for hospitalized children of all ages whose parents either cannot accompany them or chose not to be present. The current and widely held philosophy of family-centered care assumes that parents will participate in their child's care. Nurses, at times, face the dilemma of how to best care for children and prepare for their discharge without adequate family support. The "Code of Ethics for Nurses with Interpretive Statements" (American Nurses Association, 2001) makes clear that nurses must strive to respect their patients without prejudice. Does that extend to children's parents when the parents' concern for their child is not obvious by virtue of their presence? Sixty years ago, the philosophy of care of sick children was quite different. Health care professionals did not seek the company or assistance of parents in caring for their hospitalized children. Before the advent of antibiotics and private hospital rooms, the fear of infectious disease took precedence over the effects of parent-child separation. In the mid 1950s, committees were formed in both the United Kingdom and the United States to protect the psychological welfare of children as well as their physical well-being (Harrison, 2010; Roberts, 2010). It was recommended that hospitalized children not be separated from their parents. Pediatric nurses have witnessed a paradigm shift as parents are now expected to remain with their hospitalized children. Along with the shift, there are many uncertainties for nurses, parents, and children. Very few studies have been published regarding nurses' perceptions of children who are alone in the hospital. Livesley (2005) and Zengerle-Levy (2006) have explored the stories of nurses who care for unaccompanied children. Both researchers used qualitative methods to interview nurses and found almost unanimous agreement that separation from parents was a significant concern for their young patients. Although little is known about nurses' perspectives, even less is known from the perspective of the child or parent (Roberts, 2010). The burning question that initiated this research was: How do nurses make sense of caring for children who are unaccompanied in the hospital? The interview questions were aimed at listening to pediatric nurses' experiences and feelings regarding this phenomenon. This study was conducted using qualitative, phenomenological methodology and received Institutional Review Board approval. All nurses at a Midwestern children's hospital that has both an urban and suburban campus were given the opportunity to be interviewed. Several nurses volunteered. After interviewing seven registered nurses (RNs), purposive sampling was employed to ensure diversity of subsequent participants. The additional nurses were recruited to represent greater variation by workplace, years of experience, gender, and race/ethnicity. The participants represented both genders; while most nurses were Caucasian, two were African American, and one was Latino. The range of work experience was from 8 months to 32 years. These pediatric nurses spoke for a variety of workplaces, including the emergency department (ED), operating room (OR), pediatric and neonatal intensive care, and several medical/surgical units. Although each nurse's stories were unique, by the 12th interview, it was evident that there was much similarity in nurses' feelings about the children and parents, and saturation was reached. Qualitative research methodology was used to guide interviews and conduct content analysis. Audiotapes were transcribed verbatim, and the investigator used a process of dwelling in the data and intuitively processing the phenomenon until meaning was derived (Polit & Beck, 2004). Two nurse consultants read all transcripts and collaborated on the findings establishing trustworthiness of the analysis. The following themes emerged: 1) reasons for absence, 2) variation by unit, 3) difference by age, 4) safety issues, 5) outcomes of care, and 6) judgmental feelings. Nurses' perceptions about the phenomenon of unaccompanied hospitalized children revealed their insights and concerns. Many stories carried a similar theme of a sad or frightened child. The participants gave reasons why parents could not be present with their child. They talked about specific circumstances that prohibited parental presence. The age of the child largely determined the effect on the unaccompanied child. Differences were sometimes dependent on which type of nursing unit the child was situated. Nurses talked about their feelings for themselves, and their feelings toward the children and their parents. Nurses were challenged in the interviews to verbalize how they would operationally define an unaccompanied hospitalized child and what meaning this phenomenon had for them. When participants ex pressed their feelings as pediatric nurses about unaccompanied children, they used words that ranged from sad to bitter for the children and compassionate to angry toward the parents. A recurring theme was that many parents could not reside with their child at the hospital due to basic economics. They had to work to provide for the family or keep insurance. Lack of transportation might also be a result of financial hardship, requiring parents to be dependent on the local bus schedule or cab vouchers provided by social services. Some parents lived a great distance from the hospital. One single mother moved to the city to be close to her child, only to find that she had no immediate support from family members and could not take the siblings to the hospital as a consequence of H1N1 influenza quarantines. Chronic disease was especially difficult because the length of frequent hospitalizations usually exceeded the number of days parents could be absent from work. Several nurses shared that children with cystic fibrosis or sickle cell disease spent more time without family as they got older. Acute disease was sometimes easier for the family because it was often time-limited. One nurse cited examples on the oncology unit of parents' co-workers pooling their own paid-time-off and donating it to parents who needed extended time to be with their child. [Child speaking] "I'm going to go home soon, and I'm going to go home with you." And I was like, "No, sweetie, you are going to go home with your mommy or your dad." And he…just started crying, and I felt so horrible… And he had his little backpack…because he has the NG feeding going, and he had a little backpack, it was in his backpack. And he came, and he was walking, and he [said to me], "I'm going home with you, ok? Caring for the sick child's siblings was cited as a reason for parental absence almost as often as financial concerns. This was a predominant theme from the ED nurse. When a child came to the hospital for an emergency, the parent would often have to leave and find suitable care for the siblings. Another nurse from the suburban hospital spoke about the parents of a set of quadruplets. One of the children had chronic health problems that necessitated many inpatient days. The father had to maintain his job, and the mother had three other young children who required her care. The stories from nurses varied considerably by the nurse's workplace. If the neonatal intensive care (NICU) infant was the first-born, mothers would already have time off from work through maternity leave benefits. The parents might visit less frequently and appear to detach from the infant if the infant was hospitalized for an extended time period. In the ED, many adolescents sought care without their parents. The nurse stated that staff always tried to contact parents, but many times, parents were unavailable or sometimes chose not to make the trip to the ED. A particularly chilling image was recounted by the OR nurse. Children who became organ donors appeared just like other anesthetized children until their organs were harvested. As the ventilator was removed and vital processes ceased, the child was frequently surrounded only by strangers – the operating room staff. Actually [the patient] was doing really bad; we actually had to transfer him to the PICU. But we never could get a hold of parents… I think the third day they finally came back to the hospital without being [asked], checking what's going [on], anything like that. So, [parents] "Where's my child?" [Nurse] "Well…we have a lot to talk about." But when it'…an 18-month-old that's alone, it's a whole different story because they're not going to just be content to lay in the crib and watch the mobile. They need somebody in there. They are going to scream and cry if you leave them in the crib alone. And it just requires a lot more time. And…it's just hard. I don't have time to be in the room with them all the time, obviously, because it's not my only patient. Safety is always a priority in nursing care. It was not surprising that participating nurses mentioned fears for the safety of unaccompanied children. Their concerns ranged from anxiety for unaccompanied siblings darting around the ED waiting room to children in isolation rooms getting tangled in their tubing. Adolescents who appeared in the ED without parents often elicited unease for the nurses, particularly pondering the veracity of their medical histories. Unaccompanied toddlers needed to be placed in cage cribs for their own safety. This was disheartening to nurses who observed them cry and struggle to get free. Placing a young unaccompanied child in a regular bed was even more frightening because there were too many sources of potential injury in their environments. In the pediatric intensive care (PICU), a nurse revealed that parents who were vigilant noted physical signs in their children that busy nurses could not observe. These events ranged from subtle seizures that were not detected on the monitors or potential infusion malfunctions. Nurses expressed that children without parents in attendance were often more highly sedated. Another danger was sustained crying in infants with hemodynamically unstable congenital heart defects. Crying necessitated that nurses comfort these fragile infants during their parents' absence. A prevailing theme was that parents' unavailability during hospitalization led nurses to fear that parents were not prepared for their child's home care. If the parents only returned to the hospital to retrieve their child, discharge teaching be came expedient. There may not be time for skills practice, or physicians may be unavailable to answer parents' questions. Many participants commented that this scenario could add to the length of stay and expense. Almost all nurses believed that unaccompanied hospitalized children received the same level of restorative care as children who were accompanied. Many participants believed that nurses spent more time with unaccompanied children. Perceived differences were not limited to deficient parental time; nurses were concerned about the lack of bonding between parent and child, resulting in potential developmental delays. A PICU nurse talked about a 6-month-old who was still being swaddled and treated as a newborn by the nurses. The infant could not explore his environment with his arms or legs, thereby limiting appropriate stimulation. On the medical/surgical units, young children were often brought out to the nurses' station, allowing them to interact with people and observe events outside their rooms. A compelling scenario as described by one study nurse was of infants laying in their cribs for four hours between vital sign assessments. A problem that may be specific to children in intensive care units was that parents need to be present to make end-of-life decisions. A PICU nurse reiterated the words of parents who have not seen their child's suffering "Do everything you can… Save them no matter what it takes." Basic collaboration is often missing when parents cannot be present, and children may suffer from the disparity. Study participants may have represented a select group of nurses who were more aware of their feelings about family inequities. Overall, they were willing to state that they sometimes judged parents but attempted to understand the situation from the parents' perspectives. They voiced that they occasionally felt like babysitters for parents. The more experienced nurses expressed that they often needed to correct damaging stereotypes among other nurses. One nurse spoke of challenges when caring for victims of child abuse and reserving judgment against the parents. Foster parents seemed to be the most immune from judgment. A nurse participant revealed the moment she ceased judging parents. It was the experience of a mother who ran over her own child with a lawnmower. This mother had arranged for a babysitter and went to a home nearby to mow. The babysitter brought the child over to where the mother was mowing, and the child ran in front of the mower. The nurse stated, "Oh my God, she ran over her own child with a lawnmower…but she'd done all the things you were supposed to do. To where I thought…I'm not here to judge, I'm here to take care of this child." Negative appraisals may deter parents' hospital presence or make them fearful to leave. A study participant commented that although it is helpful to hear the rationale for parents' absence, she realized that divulging personal information becomes a source of gossip among nurses. Families were stereotyped and labeled as "problems" in report. One nurse found that after offering water to a wheelchair-bound grandmother who was labeled as a problem, rapport was established with the family. One mother brought her infant back to the hospital and told social services that she could not provide the necessary care. This interviewee applauded the mother's strength and self-awareness. She chose not to judge her for her inability to deliver care, realizing that the infant would be safer with foster parents. The pediatric nurses speculated that many parents were apprehensive about leaving their child in the hospital for fear that something bad would happen. You go in to read to him, and he is stimulated by it, and you can tell he is happy, and he is calm. But the rest of the time, he just cries and arches, and everyone just thinks that he is just a miserable, fussy baby. But he never has anybody to bond with, and he never has consistency or somebody to hold him. There was a slight perception that racially/ethnically diverse parents were treated differently than Caucasian parents. Reports were that Latino children were often surrounded by family. Nurses stated that African-American children were often unaccompanied. Racial differences may be confounded by socioeconomic status in some cases. An African-American nurse stated that Caucasian parents were judged less harshly when circumstances were equal. The nurses were asked to invent their own definition of an unaccompanied hospitalized child. There was considerable variation in their definitions, and an actual definition was not developed. Some nurses defined the phenomenon by the length of time the parent was absent, some by the child's age or diagnosis, and some were philosophical. Many nurses accounted for the parents' extenuating circumstances before defining the child as alone. Some participants defined "accompanied" by the child's age; younger children's (excluding newborns) parents needed to be present for longer periods of time. The hospital unit staff informally determined appropriate timeframes for parental presence. In the PICU, parents were considered to be present if they visited once each day. On some of the medical/surgical units, parents were present if they were in the child's room all day leaving for up to one hour no more than three times each day. The NICU nurse stated that neonates were never unaccompanied because nurses were vigilant. Other nurses concurred that although parents were not in attendance, there was always a nurse watching over the child. Making meaning of the phenomenon was the most difficult question for the participants to answer. Nurses had to scrutinize their personal feelings of parental responsibility. Upon examining the historical perspective that 60 years ago parents were uninvited visitors to their sick child, it makes sense that many families still believe that children are expertly cared for in their absence. Hospital practitioners continue to convey to families that they offer the child the best therapeutic care. The paradigm has evolved according to the pediatric nurse participants in this study. The current belief is that parents provide the best emotional care. Some nurses articulated that when parents had to make choices, leaving their child in a safe place was the best alternative. Interviews were conducted with 12 pediatric nurses who represented a range of ages, encompassed both genders, were inclusive of some racial/ethnic diversity, and exemplified many different clinical units. Research questions elicited nurses' perceptions of unaccompanied hospitalized children. Specifically, questions were designed for responses about equality of care between children with parents in attendance and those without their parents present. It was apparent that children without parents in attendance received more of the nurse's time. Potential solutions include incorporating an inquiry about the parents' ability to stay with their child during admission data collection. Attempts to assign the same staff to unaccompanied children would be advantageous but difficult to execute in a three-day work week. Some nurses described taking children as their "primaries," but unit policy dictated that parents had to be in attendance and give permission to set up this nursing plan. Two significant safety issues were uncovered in this small sample. The first was the perception that unaccompanied children were often more sedated. The second was that unaccompanied children were sometimes swaddled at ages beyond when developmentally appropriate. Sedation and restraint of movement can lead to iatrogenic secondary difficulties, such as skin breakdown, medication withdrawal, respiratory depression, and bradycardia (Cote, Notterman, Karl, Weinberg, & McCloskey, 2000; Tobias, 2000). It seems essential that staffing ratios should incorporate more than the child's diagnosis and scheduled nursing interventions, but also whether parents will be in attendance. Pediatric nurses are aware of the increased needs and safety concerns of unaccompanied hospitalized patients. In addition, this study revealed nurses also need to be aware of judgmental attitudes. Prejudging is part of human behavior, but prejudice is a result of stereotyping people when failing to understand other perspectives. According to Yagil, Luria, Admi, Moshe-Eilon, and Linn (2010), nurses should become mindful of their own preconceptions about families. The nurse participants were clear that the lack of parental presence for hospitalized children was challenging for nurses and possibly detrimental to these young patients. In reality, all parents cannot be with their hospitalized children at all times. Acceptance of this is paramount and can foster open communication with families who cannot be in attendance. As one nurse stated, "It is the nurse's responsibility to involve, empower the family." When parents feel valued by nursing staff, it is likely that even our youngest patients can sense harmony among the adults caring for them. Cote, C.J., Notterman, D.A., Karl, H.W., Weinberg, J.A., & McCloskey, C. (2000). Adverse sedation events in pediatrics: A critical incident analysis of contributing factors. Pediatrics, 105(4), 805–814. Harrison, T.M. (2010). Family-centered pediatric nursing care: State of the science. Journal of Pediatric Nursing, 25(5), 335–343. Livesley, J. (2005). Telling tales: A qualitative exploration of how children's nurses interpret work with unaccompanied hospitalized children. Journal of Clinical Nursing, 14, 43–50. Polit, D.F., & Beck, C.T. (2004). Nursing research: Principles and methods (7th ed.). Philadelphia: Lippincott Williams & Wilkins. Tobias, J.D. (2000). Tolerance, withdrawal, and physical dependency after longterm sedation and analgesia of children in the pediatric intensive care unit. Critical Care Medicine, 28(6), 2122–2232. Zengerle-Levy, K. (2006). Nursing the child who is alone in the hospital. Pediatric Nursing, 32(3), 226–231. Roberts, C.A., & Messmer, P.R. (2012). Unaccompanied hospitalized children: Nurses search for understanding. Journal of Holistic Nursing, 30(2), 117–126. The author acknowledges that her original research has been published in the Journal of Holistic Nursing. This article introduces that research in an evidence-based format that is a clinically based, point-of-care review for the clinician at the bedside. The author received a Dee Lyon's Research Scholars Grant from Children's Mercy Hospitals and Clinics in Kansas City, MO. Pediatr Nurs. 2012;38(3):133-136. © 2012 Jannetti Publications, Inc.
Posted: 07/20/2012; Nurs Econ. 2012;30(3):148-152. 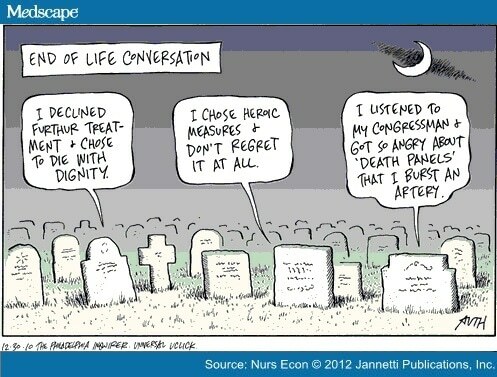 © 2012 Jannetti Publications, Inc.
During the height of the Affordable Care Act (Strokoff & Grossman, 2010) debate, an editorial cartoon symbolized the perspectives on endof- life choices, with a humorous twist (see Figure 1). Headlines of "death panels" dominated the news for a while, but unfortunately, did not lead to a national conversation on end-of-life care. The purpose of this article is to reflect on the critical elements in the question, "How can we afford to die?" based on our combined career of over 60 years in oncology nursing and to suggest actions that nurses can take in this ongoing debate. We both began our oncology nursing careers in the 1970s and witnessed at least three high-profile national debates on end-of-life issues (see Table 1). Each of these public debates gave us hope that sweeping and effective societal change toward end-of-life care would occur. The Patient Right to Self-Determination Act of 1990 (H.R. 4449) was passed in 1990 and implemented in 1991, requiring that patients be informed about advanced health care directives on admission to health care institutions. Although this may have been technically implemented, subsequent studies have shown the intent of this legislation has not been widely adopted. Sadly, this is not unusual when the letter of the law is implemented but the intent is missed. In 2010, while 61% of older Ameri cans feared outliving their savings more than they feared dying (Fleck, 2010), only 20%-30% of adult Americans reported having advanced directives (Sedensky, 2010). Karen Ann Quinlan http://www.wired.com/science/discoveries/news/2008/06/dayintech_0611 1975 - 1985 Parents requested removal of support machines after she was declared to be in a persistent vegetative state; physicians would not remove; parents took request to court and were supported. This was the first "right to die" case in U.S. legal history. Nancy Cruzan http://www.libraryindex.com/pages/590/Court-End-Life-CASE-NANCY-CRUZAN.html 1983 - 1990 Parents requested removal of feeding tube; physi-cians agreed, but the Missouri state attorney general on behalf of the hospital took this to court; ulti-mately the Supreme Court upheld the Missouri Supreme Court's ruling to allow removal. Patient Self-Determination Act. Proposed by Senator John Danforth (MO), passed into law by the U.S. Congress on October 26, 1990 and took effect on November 1, 1991. Terri Shiavo http://www.nndb.com/people/435/000026357 1990 - 2005 After 10 years, husband asked to have the feeding tube removed; conflict between husband and her parents regarding her wishes as she had no writ-ten advanced directives; national attention as social conservatives objected to the removal think-ing it would set precedent for right-to-die movement. Five years after her death, studies showed no increase in people who have written advanced directives. Why the paradox? Why the heated debates about "death panels" in health care reform? We believe much of this is due to how our society deals, or doesn't, with death. Looking at the cancer population, we see findings that reflect aggressive, costly, and often ineffective care at end of life and limited engagement in palliative care and hospice services (see Table 2). We are bombarded with media stories of heroic end-of-life rescues that technology and skill have made possible. Yet, with the recent exceptions of Elizabeth Edwards, Randy Pausch, and Steve Jobs, the more heroic stories of quiet choices rarely get highprofile media attention. SOURCE: Dartmouth Atlas of Health Care (2012). The question, "Life at what cost?" has a myriad of answers depending on the circumstances. To the parents of a premature low birth weight infant, all too common in the United States, the answer may be "whatever it costs!" To the octogenarian with advanced cancer, the answer might be "enough is enough." In between those chronological endpoints are endless circumstantial variations due to age, the nature of disease, family, insurance coverage, personal financial and support resources, and spiritual beliefs. In all these scenarios, however, is the increasing question of the cost of care and the inequity in the United States of the "haves" and "have-nots." Those with insurance have options those without do not have. Even within the insured population, depending on the plan and co-payment responsibilities, options of care can vary widely. At the nexus of the financial and life crisis is the health care team, and it is often the nurse who is asked the difficult questions by the patient or the family in the middle of the night in the hospital, hospice, or skilled nursing facility. The solution to the question, "How can we afford to die?" while enlightened by research, must ultimately be addressed through a discourse we have not yet had in the United States: What is our moral belief about health care, not about prolonging life at all cost? We must ask ourselves "life at what cost?" Research has already demonstrated the cost/benefit of end-of-life care provided outside the acute care setting (Brumley et al., 2007; Enguidanos, Cherin, & Brumley, 2005; McBride, Morton, Nichols, & van Stolk, 2011). Surveys have shown the majority of people do not want to die in hospitals, yet many do. Luckily, this trend is beginning to change (Gomes, Calanzani, & Higginson, 2012; Hansen, Tolle, & Martin, 2002; Wilson et al., 2009). Ultimately, the conversation must happen at the local, individual level. But nurses miss opportunities to initiate or facilitate these conversations (Boyd, Merkh, Rutledge, & Randall, 2011). Research can evaluate strategies for intervening with patients and families and for preparing health care professionals on how to initiate and conduct these critical conversations. When one denies that death is inevitable, talking about end-oflife wishes becomes a difficult and uncomfortable, and even surreal, conversation. How do you want to live your life in the last few years/months/weeks? Where do you want to live them? How do you want to be cared for? Mahon (2011) suggests asking two questions: "If you cannot, or choose not to participate in health care decisions, with whom should we speak?" and "If you cannot, or choose not to participate in decision making, what should we consider when making decisions about your care?" This conversation is best initiated prior to needing the answers to these important questions and should be revisited periodically. We both have personal experiences with our own family members being more and less open to these discussions. We have cared for patients who are ready for these discussions and their families were not and vice versa. We also have witnessed when there is a discrepancy between patient and family and within the family to know when enough is enough. The consequences of a death when everyone is not on the same page can be that the family and providers are left with debilitating emotions of anger, guilt, or regret. Yet we have also witnessed the positive outcomes when patient, family, and providers are all on the same page. This is such a qualitatively better experience; one everyone deserves. Why doesn't this happen more often? One reason may be that it requires frank conversations about values, beliefs, desires, and fears. These can be sensitive and time-consuming conversations that need to occur between the patient and family and between patient and health care provider. Yet Iezzoni, Rao, DesRoches, Vogeli, and Campbell (2012) found that more than half the physicians in their study admitted they had given a prognosis more positive than the facts supported. If a patient does not have an honest picture of the prognosis, a realistic conversation can't even begin about end-of-life care. When it does, concerns about the financial impact of endof- life care for the individual and his or her family, differences between patient and family wishes, and fears of abandonment from the health care provider can overshadow the quality-of-life desires of the individual. These conversations are difficult to conduct in a brief office or inpatient visit, especially if someone's health is deteriorating. However, studies have shown that patients are worried about these issues and want to talk about them (Wentlandt et al., 2011). Other barriers to effective counseling on end-of-life care include health care providers who are inadequately prepared to have these conversations, the fragmentation of care that individuals with multiple chronic illnesses receive, and lack of reimbursement for these discussions. The concept of a "medical home" may help address these barriers, but until outcomes of this structure are measured and disseminated, it remains just a concept. To paraphrase Mohandas Gandhi, we must be the change we wish to see in our health care world. Thus, there are actions that nurses can take to educate themselves and others about the costs and options of end-of-life treatment and to advocate for death with dignity. Some actions are small, others grand, but nurses can and must engage in them. Complete your own advance directives and health care proxy. Have discussions with family members about their wishes and communicate your own wishes. Help family members complete advance directives and health care proxies if needed. Nurses have the unique trust relationship with the public that positions them as effective educators about end-of-life discussions and advocates for elevating this conversation locally and nationally. There are many approaches to educating the public. Cipriano (2012) describes facilitating a discussion for her local hospice after the screening of the film, "Consider the Conversations: A Documentary on a Taboo Subject." Presentations and discussions for church groups or at community service organizations are frequent venues where nurses can volunteer their expertise. In this issue, Short (2012) references a challenge undertaken by DNP students to influence others to complete advance directives. Others can take up this challenge. Politics are local and thus, nurses should use the local media to inform the community on the differences in prolonging life at all costs and dying with dignity. Misinformation, such as in the "death panels" hysteria, needs to be corrected immediately and frequently. Communication to legislators about proposed policies is easy given today's electronic connections. Technologies for both improving the health of patients and supporting a dignified death need more extensive use and funding. A recent study by White and Coyne (2011) reinforces the need for continuing education in end-of-life care and showed the second highest rated core competency needed by nurses is communicating about death and dying. Content can be developed to support nurses in gaining skill and confidence in their ability to discuss end-of-life decisions with patients or policy needs with legislators in every nursing degree and relevant continuing education program. The curriculum offered by the Oncotalk® program can be accessed and adapted for student groups. Experiences for health professions students focused on endof-life decisions begins the process of preparing future generations of care providers to collaborate on these complex issues. Identifying factors that inhibit or foster better end-of-life care. Testing strategies for effectiveness in preparing health professions students to communicate with patients about end-of-life choices. Evaluating what methods are most successful for introducing and having completed advanced directives. Finding what interventions prevent hospitalization when crises occur at end of life. Assessing approaches to less en caregiver burdens. What happens if the patient says he or she has an advance directive/health proxy? Where are these wishes documented? What happens if a patient doesn't have an advance directive/health proxy? Are there resources to assist the patient to complete an advanced directive? What is the process to evaluate how well the information is documented in the patient's record? There are abundant resources available to nurses on the Internet. Innu merable web sites offer access to advance directives forms tailored to state requirements. Professional organizations have resources specific for health care professionals as well as for the public. Two resources we find helpful are the Jewish Healthcare Foundation's Closure (2012) web site and The American Society of Clinical Oncology (2011) patient education booklet about advance directives. Nurses have the honor of consistently being ranked as the most trusted professionals by the public (Gallup, 2012). This trust gives us an opportunity to raise the conversation about the most difficult of questions, "How can we afford to die?" In our death-adverse society, in which care at all cost continues to increase the overall cost of health care, this is a question that must be deliberated and answer ed. Top-down policies will not provide the solution. Nurses can advocate for death with dignity through local conversations, initiatives, and individual encounters and ignite this transformation. Every nurse can and must be part of leading this change. With a combined career of over 60 years in oncology nursing, the authors reflect on the critical elements in the question, "How can we afford to die?" Three high-profile patient scenarios in three different decades promised to improve use of advance directives but did not. Recent societal events, including the debates about health care reform, have brought attention again to end-of-life issues and care. Quickly approaching a "perfect storm" of an aging population, an inefficient and costly illnessoriented health care system, and health care profession shortages, the United States will not be able to afford delivering futile interventions. Nurses, who are consistently seen as the most trusted professionals, must take action in strategies the authors present. Boyd, D., Merkh, K., Rutledge, D., & Randall, V. (2011). Nurses' perceptions and experiences with end-of-life communication and care. Oncology Nursing Forum, 38(3), e229-e239. Brumley, R., Enguidanos, S., Jamison, P., Seitz, R., Morgenstern, N., Saito, S., … Gonzalez, J. (2007). Increased satisfaction with care and lower costs: Results of a randomized trial of in-home palliative care. Journal of the American Geriatric Society, 55(7), 993–1000. Cipriano, P. (2012). When it's my time to die. American Nurse Today, 7(1), 6. Enguidanos, S.M., Cherin, D., & Brumley, R. (2005). Home-based palliative care study: Site of death, and costs of medical care for patients with congestive heart failure, chronic obstructive pulmonary disease, and cancer. Journal of Social Work in End-of-Life and Palliative Care, 1(3), 37–56. Gomes, B., Calanzani, N., & Higginson, I.J. (2012). Reversal of the British trends in place of death: Time series analysis 2004–2010. Palliative Medicine, 26(2), 102–107. Iezzoni, L.I., Rao, S.R., DesRoches, C.M., Vogeli, C., & Campbell, E.G. (2012) Survey shows that at least some physicians are not always open or honest with patients. Health Affairs, 31(2), 383-391. Mahon, M. (2011). An advance directive in two questions. Journal of Pain and Symptom Management, 41(4), 801–807. McBride, T., Morton, A., Nichols, A., & van Stolk C. (2011). Comparing the costs of alternative models of end-of-life care. Journal of Palliative Care, 27(2), 126-133. Schroeder, J.E., Mathiason, M.A., Meyer, C.M., Frisby, K.A., Williams, E., & Go, R.S. (2008). Advance directives (ADs) among members of the American Society of Clinical Oncology (ASCO). Journal of Clinical Oncology, 26 (Suppl. ), abstract 20611. Short, N.M. (2012). The final frontier. Nursing Economic!, 39(3), 185–186. White, K.R., & Coyne, P.J. (2011). Nurses' perceptions of educational gaps in delivering end-of-life care. Oncology Nursing Forum, 38(6), 711–717. Wilson, D.M., Truman, C.D., Thomas, R., Fainsinger, R., Kovacs-Burns, K., Froggatt, K., & Justice, C. (2009). The rapidly changing location of death in Canada, 1994–2004. Social Science & Medicine, 68(10), 1752–1758. Nurs Econ. 2012;30(3):148-152. © 2012 Jannetti Publications, Inc.
July 10, 2012 — Researchers are reporting that proximity to a tablet computer can interfere with settings of magnetically programmable shunt devices, which are often used to treat children with hydrocephalus. The Apple iPad 2 (Apple Inc.) contains magnets that can change valve settings in the shunt if it is held too close to the valve — within about 2 inches. Such a change may result in shunt malfunction until the problem is recognized and the valve is readjusted to the proper setting. Patients and their caregivers should monitor use of the tablet computer to ensure that no change is made to the valve settings, researchers say. Cormac O. Maher, MD, a pediatric neurosurgeon and senior author of the report, said he hopes to raise awareness of this potential interaction through publication of this study. This is not to say that the iPad 2 cannot be used safely in the vicinity of patients with programmable shunts, they write. "With proper precautions to keep a tablet device away from close proximity to the valve, the continued use of these devices, even in the general vicinity of patients with programmable shunt valves, appears to be safe," they conclude. A variety of magnets can be found in households today, and the authors state that the magnetic field strength of the iPad 2 lies within the range of these everyday magnets. Patients and caregivers should regard precautions surrounding use of the iPad 2 to be the same as those taken with other household magnets. These results were published online June 26, and appear in the August issue of the Journal of Neurosurgery: Pediatrics. Researchers initiated the study after a tablet computer seemed to affect a programmable shunt in one of their patients, a 4-month-old girl with hydrocephalus. Three weeks after the baby received the shunt, she was examined for shunt malfunction due to a changed setting in the magnetically programmable valve that regulates the flow of cerebrospinal fluid. The baby's mother stated that she had held an iPad 2 while holding the infant. Programmable shunt valve settings can be altered by exposure to magnetic fields. Indeed, specialized magnets are used by physicians to adjust the settings on these valves. Because in this case no other environmental factor could be identified that would have led to a shift in the valve settings, the authors decided to test whether the iPad 2 might be implicated. Unlike the initial iPad, the iPad 2 contains several magnets and is often used with an Apple Smart Cover, which contains additional magnets. The researchers tested 10 programmable shunt valves with a variety of settings. They exposed the valves to an iPad 2 with and without the Smart Cover at different distances: less than 1 centimeter (cm), 1 to 2.5 cm, 2.5 to 5 cm, 5 to 10 cm, and greater than 10 cm. Each exposure lasted 10 seconds. Overall, the valves were tested 100 times for each of the 5 distances during exposures to the iPad 2 with the Smart Cover closed, and 30 times for distances less than 1 cm for the tablet computer without the cover. After exposure of the programmable valves to the iPad 2 and Smart Cover at distances of 0 to 1 cm, researchers found that the settings had changed in 58% of the valves. After exposure at distances of 1 to 2.5 cm, the settings had changed in 5% of the valves, and after exposure at distances of 2.5 to 5 cm, the settings had changed in only 1% of the valves. No changes in valve settings were identified after exposures at higher distances. After exposure of programmable valves to the iPad 2 without a cover, which was tested only at distances of 0 to 1 cm, researchers found that the settings had changed in 67% of the valves. Although no change in setting was found past a distance of 5 cm (2 inches), the authors caution that patients and caregivers should be made aware of the potential for a change in the settings of a magnetically programmable shunt valve if an iPad 2 is placed very near. The authors have disclosed no relevant financial relationships concerning the materials or methods used in this study or the findings specified in this paper. Journal of Neurosurgery: Pediatrics.2012;10:118-120. Published online June 26, 2012. Abstract.